Mashed Potatoes is my all time favorite dish. Any potatoes in my opinion is amazing, but Mashed Potatoes are number 1! There are countless ways to make delicious Mashed Potatoes, you can add Butter, Milk, Whipping Cream, Sour Cream, Yogurt, or Chicken Broth. I like to keep things and easy, especially since I am usually making them for a holiday. I would rather enjoy the holiday then spending a ton of time creating something fancy. When sitting down to plan my Thanksgiving dinner last year I made an effort to put a healthier twist on each dish. I decided to take my classic Mashed Potato dish and make it dairy free. I tried different Nut Milks and alternatives when creating this recipe. I found that Almond, Coconut and blended milks left a funny taste to the Mashed Potatoes. Chicken Broth didn’t give the Mashed Potatoes the fluffiness, but instead left them flat. I had some Cashew Milk in the fridge, we use it as a coffee creamer and it was PERFECT! Cashew Milk doesn’t get much attention, but it has become a staple in our because of the creaminess to it and great taste. Whats amazing is this bowl of deliciousness tasted just like my “dairy filled” mashed potatoes. They are just a creamy with no funny taste. WIN. If you want to call it that… is to find the perfect balance of seasoning. Using Salt Free Ghee requires you to add a little more Sea Salt then if you were to using items that contains Salt. One thing I have come to realize is if I add a little more Salt to the water when boiling the potatoes then I use a lot less when mashing them. The potatoes soak in all the flavor from the water. Then I tried throwing in a little bit of Garlic Powder to the water. I found it adds a nice flavor, without a strong or overbearing Garlicky taste. I had started doing this when making my Garlicky Mash Potatoes. I just decreased the amount of Garlic I add to these Mashed Potatoes. If you want to make them with regular Milk or Butter then I would suggest using Salt Free butter and adding a little extra milk till you get the desired texture. Just do a one for one substitute. 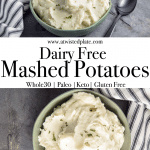 I hope you ENJOY this Dairy Free twist to your classic Mashed Potato recipe! Peel potatoes (unless you like the skin in you Mashed Potatoes) and cut into 1 inch cubes. Add 5 cups of Water, 1 teaspoon of Sea Salt and 1/2 teaspoon Garlic Powder to Pot and bring to a low boil. Add you cubed potatoes and continue on a low boil for about 20 minutes or until the potatoes are soft when you poke them. Drain your Potatoes and add them to a Mixing Bowl (make sure it has higher sides and when the potatoes are in there it is only half full. Add Ghee, Cashew Milk 1/4 teaspoon of Salt and Pepper. Using a hand mixer, on a low speed, mash your potatoes.